Graphene, a modified form of carbon, offers versatile potential for use in coating machine components and in the field of electronic switches. 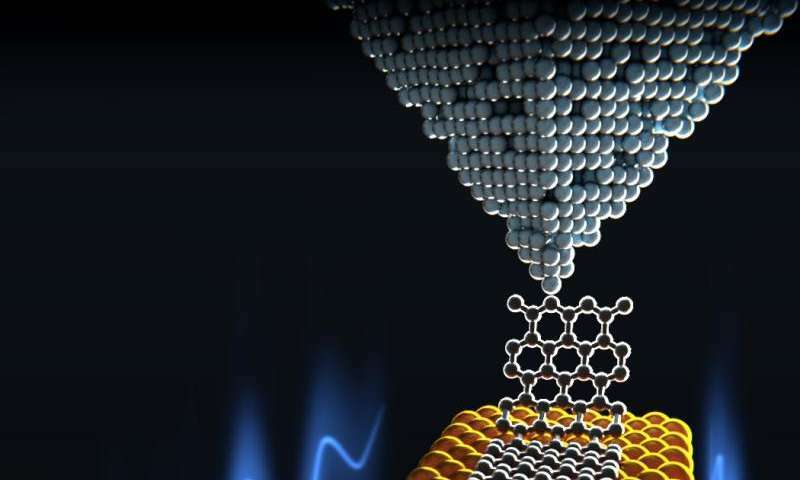 An international team of researchers led by physicists at the University of Basel have been studying the lubricity of this material on the nanometer scale. Since it produces almost no friction at all, it could drastically reduce energy loss in machines when used as a coating, as the researchers report in the journal Science. In future, graphene could be used as an extremely thin coating, resulting in almost zero energy loss between mechanical parts. This is based on the exceptionally high lubricity—or so-called superlubricity—of modified carbon in the form of graphene. Applying this property to mechanical and electromechanical devices would not only improve energy efficiency but also considerably extend the service life of the equipment. An international community of physicists from the University of Basel and the Empa have studied the above-average lubricity of graphene using a two-pronged approach combining experimentation and computation. To do this, they anchored two-dimensional strips of carbon atoms—so-called graphene nanoribbons—to a sharp tip and dragged them across a gold surface. Computer-based calculations were used to investigate the interactions between the surfaces as they moved across one another. Using this approach, the research team led by Prof. Ernst Meyer at the University of Basel is hoping to fathom out the causes of superlubricity; until now, little research has been carried out in this area. By studying the graphene ribbons, the researchers hope to learn about more than just the slip behavior. Measuring the mechanical properties of the carbon-based material also makes sense because it offers excellent potential for a whole range of applications in the field of coatings and micromechanical switches. In future, even electronic switches could be replaced by nanomechanical switches, which would use less energy for switching on and off than conventional transistors. The experiments revealed almost perfect, frictionless movement. It is possible to move graphene ribbons with a length of 5 to 50 nanometers using extremely small forces (2 to 200 piconewtons). There is a high degree of consistency between the experimental observations and the computer simulation. A discrepancy between the model and reality appears only at greater distances (five nanometers or more) between the measuring tip and the gold surface. This is probably because the edges of the graphene nanoribbons are saturated with hydrogen, which was not accounted for in the simulations. "Our results help us to better understand the manipulation of chemicals at the nano level and pave the way for creating frictionless coatings," write the researchers. That already makes me think of visions of solid graphene cores surrounded by a spinning drum of gold or gold alloyed with copper to generate an electrical field or the like.